Follow and like us on Facebook for real-time school updates. Since 2009, Toronto District School Board’s (TDSB) Equinox Holistic Alternative School (Equinox) has led the way for holistic academic excellence with a focus in nature-based learning. Our school follows the Ontario Ministry of Education curriculum; however, unlike standard TDSB schools, Equinox draws from a range of holistic philosophies and approaches, such as Waldorf, Reggio Emilia, and Montessori. All of these different methods integrate hands-on strategies and problem-solving activities into daily teaching practices. Furthermore, they creatively integrate subjects across different disciplines teaching the whole child—head, hands, and heart. Through this holistic approach with a focus on nature, Equinox’s students come to appreciate and value the relevance of learning and grow to understand its applications to self, society and their environment. At Equinox, we strive to build a solid foundation for learning that will successfully carry our students forward, not only through to Grade 8, but beyond. Our students are encouraged to become thoughtful, productive, and caring Canadians who are environmental stewards within their local communities, and avid life long learners. Equinox Holistic Alternative School from Equinox Holistic Alternative on Vimeo. Follow us on Facebook for real time updates about the school. 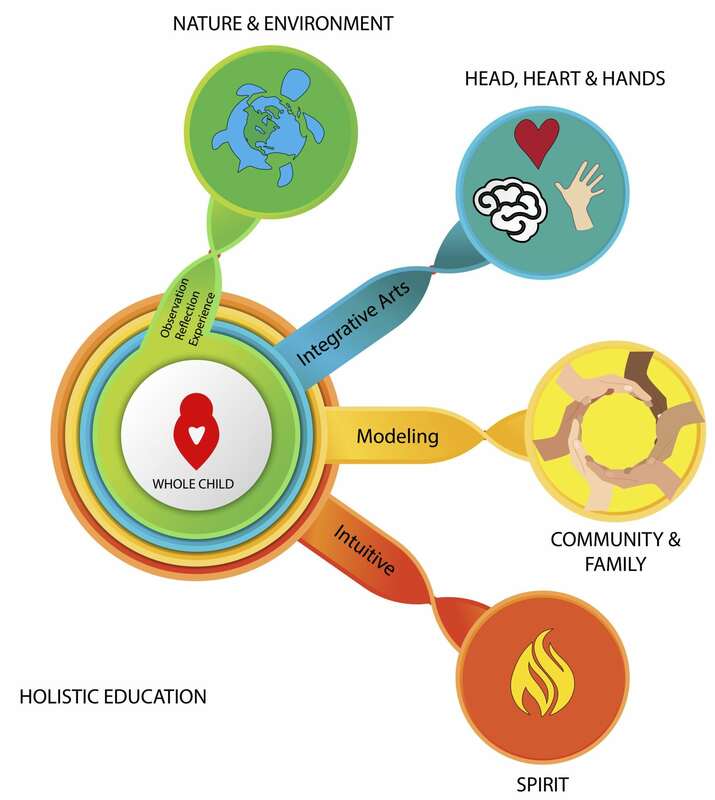 A holistic approach to education engages the head, hands and heart of the child. It makes connections, develops intuition, and encourages inquiry. The seven principles to holistic education: narrative, art, experience, inquiry, cooperative, teacher led, and project-based learning. Our school has attracted national and international interest, especially our full-day outdoor kindergarten program which is one of the first of its kind in Canada. Holistic education is an effort to cultivate the development of the whole human being. Where conventional schooling views the child as a passive receiver of information and rules, or at most as a computer-like processor of information, a holistic approach recognizes that to become a full person, a growing child needs to develop — in addition to intellectual skills — physical, psychological, emotional, interpersonal, moral and spirited potentials. The child is not merely a future citizen or employee in training, but an intricate and delicate web of vital forces and environmental influences. Jack Miller, Professor at the University of Toronto - Ontario Institute for Studies in Education. He is an internationally recognized major contributor to the field of holistic education and one of Equinox's founding partners.